Take on the Energy Challenge! Global Green and Healthy Hospitals is challenging members around the world to take on measurable actions to transition to energy efficiency and renewables. The Energy Challenge offers members a framework that enables them to benchmark their energy consumption, while empowering them to conserve energy and reduce emissions. health benefits, energy conservation benefits a hospital’s bottom line. 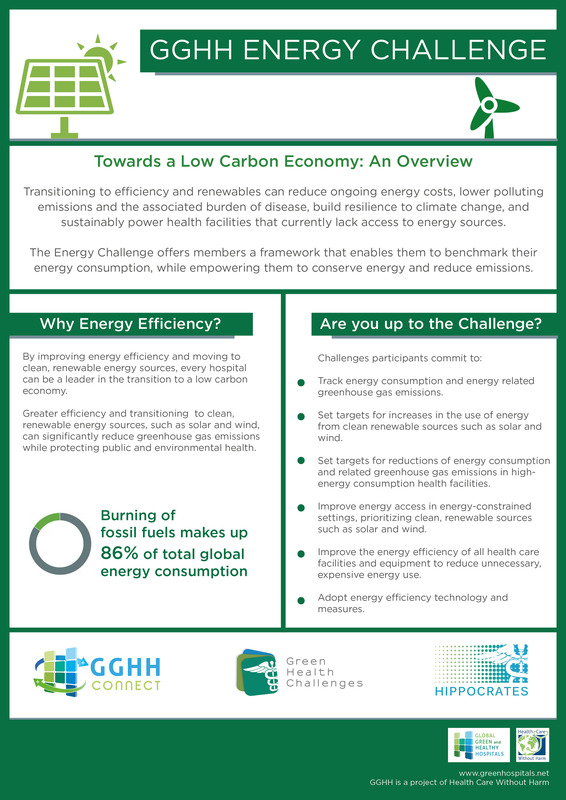 Download the Energy Challenge Information Pack for in depth information and details on the challenge and how your institution can participate. The health care sector consumes significant amounts of fossil fuel energy, thereby contributing to the health impacts of both air pollution and climate change. Meanwhile, in a number of developing nations, many health facilities lack access to the energy necessary to power basic health services. As centers of healing whose priority is to first, do no harm, preventing these risks to their community and environment is imperative for health care facilities. Aligning with UN Sustainable Development Goals and the UN Sustainable Energy for All initiative, the GGHH Energy Challenge provides a a three-pillar framework for the health sector to address these complex energy issues.